You blink repeatedly when you first see the question, thinking your eyes are playing tricks on you. It’s early—maybe you aren’t caffeinated enough for this RFP project. You go for a walk to clear your head and grab a cup of coffee. But when you come back, it still doesn’t make sense. Next you ask Joe in sales if he’ll take a look. Joe’s a dependable guy and he has a knack for reading people. Alas, even Joe can’t solve this mystery. You both say aloud what you’ve been thinking all along: What in the world? Then, you call an emergency proposal management team meeting. It’s due tomorrow, it’s mission critical at this point. But you know you must respond to every question on this RFP to have a chance at winning new business. It’s gonna be an all-nighter, but together, you’ll come up with something that will work in time for the deadline. Sound familiar? It does to us too. We’ve seen it all over the years. Just when you think you have a solid RFP response process happening, life throws you a curveball. Are you a proposal manager? This success guide was made for you. 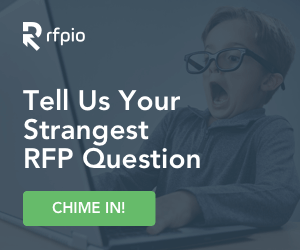 What is the Strangest Question You’ve Ever Seen on an RFP? Truthfully, we weren’t sure if there were other RFP responders out there like us who had seen outlandish questions throughout their career. We launched the survey to see what would happen. It turns out, bizarre RFP questions are a thing. Without further ado, here are some of the strange RFP question sightings from fellow responders across a multitude of industries. Prepare to scratch your head and/or chuckle with your team! Keep in mind, we are a technology software company responding to a technology software RFP. It wasn’t a question per se…but we had to supply an affidavit of compliance regarding profits derived from slavery if we were established during the slavery era. In the event of a pandemic outbreak, please describe how you would keep all systems operational. Does your solution have a feature that has been copied from your competitor? If “yes,” list out the features and explain how your solution has been designed differently. Do you charge to answer the questions? It’s the absence of the sustainability question that seems odd. In every business plan there should be the question: How does your service/product/business contribute to reduce internal combustion, fossil fuel usage, co2 emissions, generate energy, generate more clean water, reduce waste and contribute to sustainability? What is the profit size of your business? Has your firm analyzed the impact on services in the event of a pandemic outbreak? Do you make apps for the Blackberry? If you are shortlisted, would you be ready to have your product validated by one of your competitors? No joke, in a dental benefits RFP for somewhere in Texas, the question was asked, “Who is your favorite college football team?” We went with a local Texas school just to be safe! Run. We’re kidding. Don’t run. Stay and fight for that new business. Remember, if you’re dealing with a crazy question, that means your competitors are too. Sometimes an organization will throw in the wild card to see what you can do with it. Leaving a question blank is never the way to go. No matter how strange it is, do your best to come up with a response. Who knows? Maybe that question is all it takes to spook one of your competitors, so they skip it. Then, you’ll be the one that gave it your all—even if you felt ridiculous while answering it. If you have time, you can have a little fun with your team using gamification. Offer an incentive to whoever can come up with the best answer. The winning answer might be with someone who doesn’t normally contribute to RFPs. So, this obstacle in your RFP project can actually be used to promote teamwork. As always, efficiency is key. And when a question comes along that stumps you, it can eat up more of your time when you’re trying to figure out a clever or suitable way to respond. Having a centralized answer library will make it easier to find a response that is close, then you can tailor from there. If the question is completely coming out of left field, it makes sense to pull in support from your team. With RFP software, collaboration is easy when you need quick clarification. You can ping other team members with @-mentioning or on Slack. This is a better use of time for contributors, versus back-and-forth emails or random meetings. And if the question is especially challenging, you can quickly ask multiple team members for their thoughts. Of course, it’s also important to make sure you are pursuing RFPs that are a good fit for your organization. Being able to identify those opportunities is a critical part of the sales cycle. If it’s not the right fit, you don’t need to spend time on strange questions that won’t result in revenue. Bizarre questions happen to all of us RFP responders. In a way, it’s part of the process. A mind-boggling—and sometimes laugh-out-loud funny—part, but part of the process nonetheless. Agility is what makes us good at what we do. So, the next time a strange RFP question appears, take a moment to laugh, cry, or whatever you need to do. Then, come up with the best possible strategy for answering that question. The good news is that you can take some comfort in knowing that others are having the same experience as you…including us. From one responder to another, we salute you! Here’s a list of “normal” RFP questions to know, so you can respond more effectively.